There are many health benefits to foam rolling. It’s a great way to self-massage yourself. It can be done in your own home, any time that suits you, for free! It can save you a lot of money on expensive deep tissue massages and other forms of pain relief therapy. Foam Rolling provides relief from muscular aches and pain, particularly back pain. If you suffer from any kind of muscle pain it may be that it is just stuck energy that needs to be released. Foam rolling can also increase your feeling of energy, because as the muscles are massaged on the roller, stuck energy begins moving through the body again. As this energy begins moving, one’s body begins to feel more alive. It also helps increase range of motion in the body, particularly the hips, shoulders and back, which in turn helps to prevent sports injuries. Many sporting injuries occur because a part of the body has extended beyond its possible range of motion. The massaging of the muscles can also reduce recovery time after any sports, particularly body building. Reducing recovery time enables athletes to train again sooner. Furthermore it can help loosen joints and provide temporary relief from joint pain. The stimulation of the joints through foam rolling can also help the body begin to heal joint problems itself. Foam rolling can be done every day. However, be careful not to over massage one area of the body. No more than 20 minutes per day on each muscle. If your energy levels are low try foam rolling to stimulate your energy flow. Professional athletes often use massage before sports to relax the muscles and mind, as well as relieving tension, and also to help warm up the muscles and increase range of motion, to prevent injury during fast dynamic movements. Foam rolling can help in a similar way. It’s also recommended to foam roll and stretch straight after exercise to prevent muscle soreness, or the next day if you feel sore. If you suffer from muscle or joint pain, especially if you have just been injured, do not foam roll. Wait a day or two for the pain to subside. When the pain has lessened or gone completely, begin to gently foam roll to help heal your body. However foam rolling is more effective when used to prevent injuries. If you foam roll while injured, particularly for back pain, it may make it worse. Use a long foam roller to roll over the main parts of your body. If you reach a point after a few months where there is no more soreness consider graduating to a rumble roller. 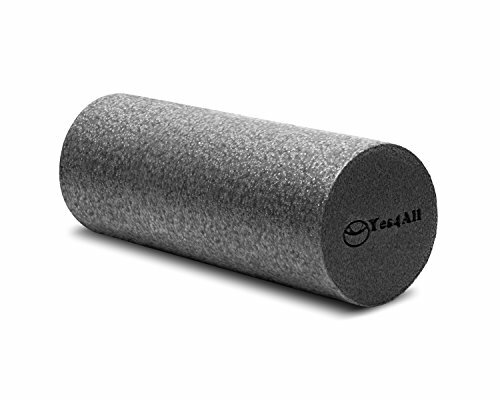 This looks and feels like a foam roller on steroids. It will really dig into those sore spots. Here is a mini foam roller I invented. I made it from a piece of plumbing pipe. I used “3M Super 74 Foam Fast Spray Adhesive” to attach pieces of a yoga mat. Use the mini foam roller to stimulate the upper back joints between the shoulder blades. Begin with the calf muscle and work your way up the body, concentrating on one muscle at a time. Foam rolling can be done on your entire body. Lift your body off the floor to apply some pressure to the muscle. Move the foam roller back and forth, and twist your body sideways very slowly until you find a sore spot. Stop and apply pressure on the sore spot for forty seconds. As you begin to breathe deeply and relax, you will feel the pain or soreness begin to dissipate. The soreness should reduce by about half; this is when you have achieved muscle release. This technique is has similar benefits to deep tissue massage. Now find another sore spot and repeat. Foam rolling is not as effective when rolling fast back and forth over a muscle, its great benefits occur when you hold and apply pressure on a sore spot. If you foam roll on a pressure point you may feel a dull pain extend through a large area of your body. This is the release of your stuck energy. For example when massaging the gluteus muscle, you may feel a dull pain extend all the way down your leg, or up into the back. When foam rolling the back, be gentle, apply the same principles. However some slow rolling back and forth can also be used, and you may be able to crack the air out of your spine. This will help loosen the spinal joints. Finally, be careful when foam rolling, listen to your body and stop if you feel any sharp pains. Consider using a professional to help you learn how to do it safely if you are unsure. Another option to gain proficiency quickly is to watch videos on YouTube or buy a DVD. For more detailed information on how to foam roll safely and effectively I recommend Tony Horton’s "P90X2 recovery + mobility DVD".